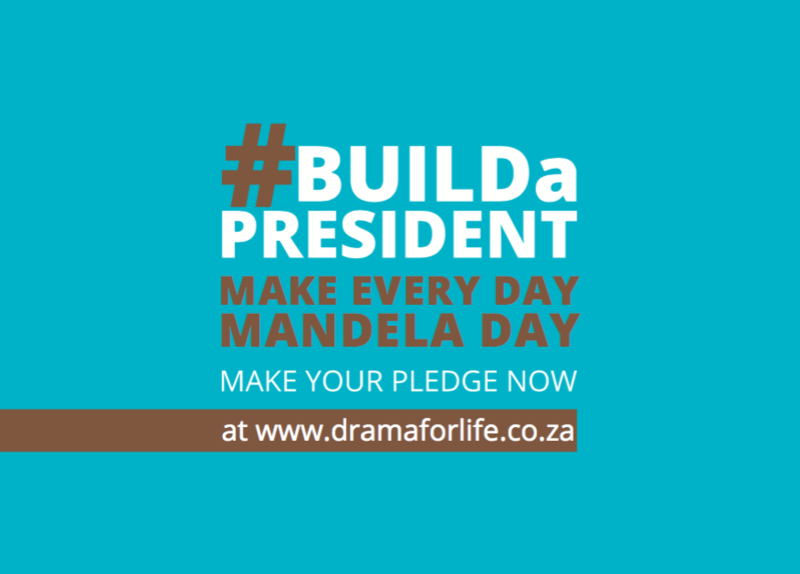 Drama for Life Build a President Project is a social media activism project that aims to build constitutional democracy in partnership with Nelson Mandela Day. Building on Nelson Mandela's legacy to enhance leadership, Build a President is a Social Change Project that encourages people to Speak Truth To Power. 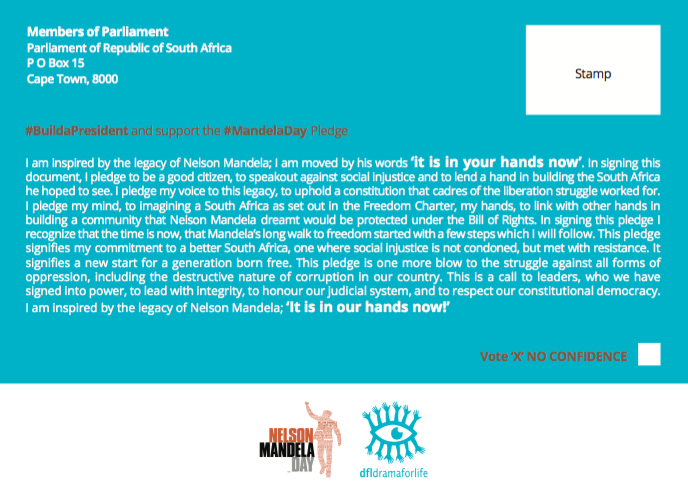 The project is endorsed as an Official Mandela Day Project, and builds upon President Nelson Mandela's legacy to enhance democratic leadership. Inspired by our partnership with Speak Truth To Power by the R.F. Kennedy Centre for Human Rights, Build a President aims to engage all people, particularly the people of South Africa, in questions that impact the quality, value and well-being of South Africa's constitutional democracy. It asks every individual what they would do if they had to become President of South Africa. It gets people to think about their own sense of agency, democratic responsibility and voice. The Build a President photographic documentation - a socio-political ethnography inspired by Speak Truth To Power and Humans of New York - serves to witness each and every individual. Through the photographs, in black and white, we get to meet ordinary South Africans from all walks of life, in work places, universities, schools, urban and rural communities, streets and meetings, and in doing so, we get to witness that all people living in South Africa have a voice, a vision and a sense of what it means to live in a young, fragile democracy. For Build a President affirms that all people in South Africa want to be heard, respected and acknowledged. Build a President specifically aims to enhance youth leadership through Drama for Life interventions, workshops and Nelson Mandela Community Dialogues. Build a President provides the space for children, adolescents and young adults to imagine a world through their individual and collective action. Build a President, through Facebook, Twitter and applied drama, drama education and drama therapy community dialogue interventions, is built on a tradition of human rights and social justice values inspired and advocated by Nelson Mandela. It is our way of Building a Nation. It is our commitment toward South Africa. It is our call to dare to serve because every day is a Mandela Day. That is why we ask you to imagine what you would change if you became president today? In this way Build a President enhances Drama for Life's commitment toward social transformation through dialogue.